C1555. BRUNO MADERNA Cond. NDR S.O. 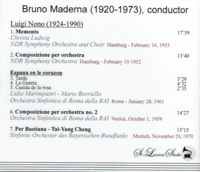 : Composizione per orchestra; w.Christa Ludwig: Memento; BRUNO MADERNA Cond. RAI S.O., Roma, w.Lidia Marimpietri & Mario Borriello: Espana en la corazon; BRUNO MADERNA Cond. RAI S.O., Venezia: Composizione per orchestra; BRUNO MADERNA Cond. Bayerischen Rundfunks-Sinfonieorch. 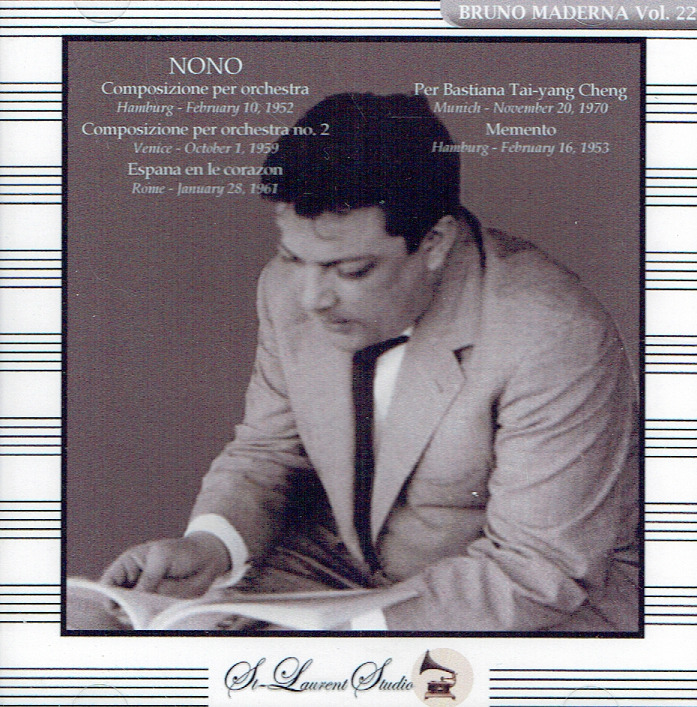 : Per Bastiana – Tai-Yang Cheng (all Luigi Nono). (Canada) St Laurent Studio YSL T-477, Live Performances, 1953-70. Transfers by Yves St Laurent. “Luigi Nono, was the most prominent of Italy's postwar avant-garde composers, [following in the style of] Arnold Schoenberg, and whose daughter Nuria married Mr. Nono in 1955. But Mr. Nono also considered his music a vehicle through which social and political issues could be addressed, and his adherence to Serialism lessened as he searched for more specific ways to convey his beliefs. Mr. Nono had some persuasive adherents among musicians, most notably the pianist Maurizio Pollini and the conductor Claudio Abbado. Carnegie Hall commissioned him to write a work for piano and orchestra as part of the Hall's centennial season. Mr. Nono…began his musical studies in 1941 at the Venice Conservatory and studied with the composer and musicologist Gian Francesco Malipiero from 1943 to 1945 while also studying law at the University of Padua. In 1946 he began studying with the Italian composer and conductor Bruno Maderna and with the West German conductor Hermann Scherchen, both of whom became early champions of his work. Scherchen brought Mr. Nono's music to the attention of the European avant-garde by conducting the 'Variazioni Canoniche' at the prestigious new music festival in Darmstadt, West Germany, in 1950. Early on, the composer developed a detailed approach to scoring that included such techniques as splitting the syllables of single words among several singers, and applying dynamic markings to virtually every note. He also tended, throughout his career, to write music that made singers and instrumentalists use the extremes of their range. 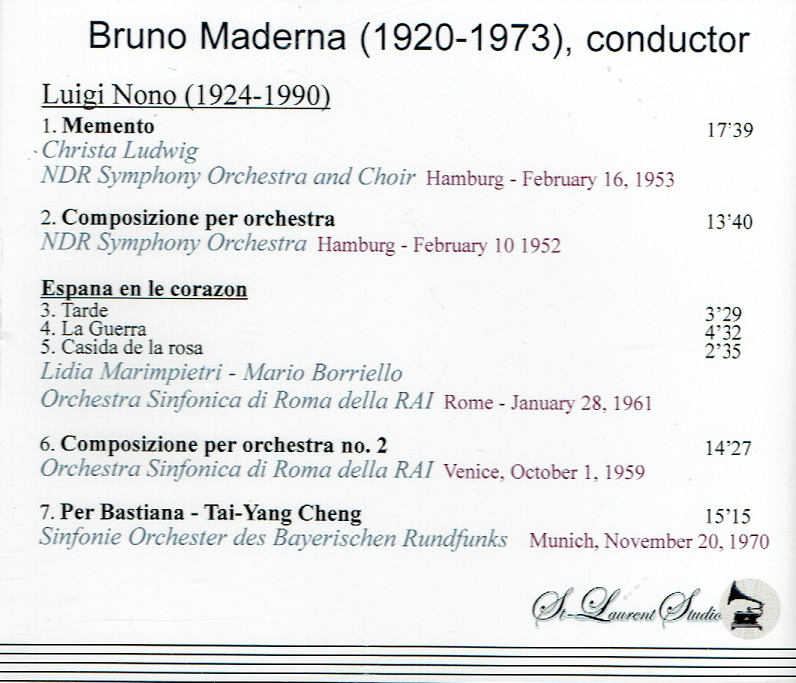 “Bruno Maderna, like his close friend and fellow avant-garde composer Pierre Boulez, had in recent years become a conductor of international reputation. Since his debut here in 1970 conducting Mercadante's opera II GIURAMENTO at the Juilliard School, Mr. Maderna had led the New York Philharmonic, the Chicago Symphony, the Philadelphia Orchestra, the Boston Symphony and the Detroit Symphony. In Europe he had conducted widely, including the London Symphony, the B.B.C. Symphony and the Concertgebouw in Amsterdam. For the last two years of his life he was music director of the Italian Radio in Milan. Mr. Maderna did not put great stock in his, or anyone's, success on the podium. ‘The era of the star conductor is finished’, he told a NEW YORK TIMES interviewer in 1972. In place of that phenomenon we must have, he contended, composer-conductors who could guide the musical life of their communities. His ideal in this respect was Mr. Boulez, the New York Philharmonic's music director. “There are great singers, and there are great artists. A great singer needs an exceptional voice, a masterful technique and the musicianship to conquer the most challenging repertoire. A true artist, of course, possesses these attributes, but there is something more - a soul-deep connection to the expressive content of the music; a sort of telepathic sympathy with the composer and a yearning to communicate that fire of inspiration to anyone who will listen. Christa Ludwig was blessed with all these things, and the opera world has been blessed in turn by her unerring ability to understand the characters she played, and to carry their joys and sorrows to the audience with such humanity and tenderness that we could not help taking her into our hearts. The beauty, warmth and radiance of her instrument seem inseparable from the beauty, warmth and radiance of the human spirit that breathes forth that wondrous sound. She made thrilling forays into dramatic-soprano territory, singing the Marschallin as well as Octavian in DER ROSENKAVALIER and giving performances of Leonore in FIDELIO that are now the stuff of legend. Perhaps most famously, she partnered her then-husband Walter Berry as the Dyer's Wife in DIE FRAU OHNE SCHATTEN.